The HP ProLiant DL580 G5 is the best in class platform for virtualization combining Intel's newest Xeon® processor technology maximum scalability and high availability features. This 4-socket server offers unsurpassed flexibility and serviceability in a versatile 4U rack-optimized form factor. 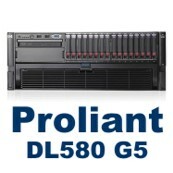 Based on the latest industry standard technologies the DL580 G5 provides the highest levels of performance demanded by today's compute intensive applications.